Review: Is the Seiko Mini-Turtle the New SKX007? Seiko’s SKX007, the 42.5-millimeter vintage-inspired diver released in 1996, has been a huge hit globally—so huge that it has become the benchmark of affordable SCUBA watches for divers, journalists, and watch-heads alike. With an exceptional finish, reasonable size, classic style, high-performance specs, and an impossibly low price (typically below $200), it’s always been hard to beat the SKX007. However, to the best of our knowledge, Seiko has discontinued the SKX007. Typical of the Japanese brand, they did so sometime recently without any announcement, and because new units are still available it was easy to miss the demise of this now-classic diver. The end of the SKX007 raises the question whether Seiko had a successor in mind, and I think we all may have missed it by nick-naming 2017’s SRPC3/4x “Mini-Turtles.” The Mini-Turtle’s flanged case and hands resemble those of the larger Turtles (the 6309 from 1976 and reissued SRP77x from 2016)*, but the similarities, perhaps surprisingly, stop there. I submit that over time we all may come to regard the Mini-Turtle as the successor (or attempted successor) to the SKX007, rather than a little version of the Turtle. The SKX007 and the Mini-Turtle are obviously not twins, but they are surprisingly close siblings. 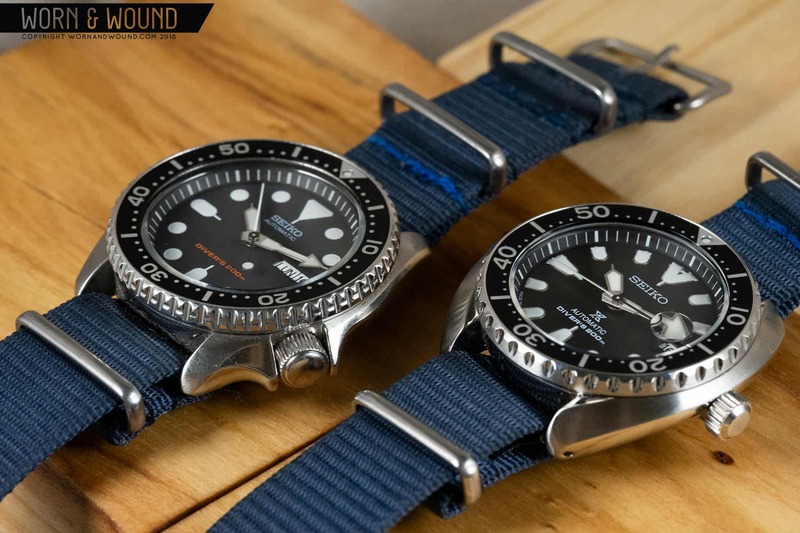 Both watches share the same role in the Seiko catalog as repositories for classic Seiko dive watch features (hands, markers, date windows, crown, etc), and both watches are nearly identical in size. Looking at the chart above, it is arguable that there was a notable shift in 1970 from more traditionally shaped cases of the 1960s to the flanged style of the 1970s. By recently discontinuing the 60s-ish SKX007 and issuing the 70s-ish Mini-Turtle, has Seiko repeated the stylistic shift of 1970? If so, perhaps the Mini-Turtle is more a direct descendant of the SKX007 than of the eponymous Turtle. Keep in mind that Seiko never named the 6309 the Turtle, nor did they name the SRPC3/4x the Mini-Turtle. * Those are just nick-names that fans have made up, with more examples including Tuna, Monster, Samurai, Sumo and so on. The names “Turtle” and “Mini-Turtle” certainly suggest a straight path between those two models, but the actual route to the Mini-Turtle (and the SKX007) is quite complex. Left to right: Mini-Turtle, SKX007, 2016’s Turtle Reissue. Disregarding the case shape, it’s clear that the SKX007 and the larger Turtle have a lot in common. That’s not to definitively say that the popularity of 2016’s Turtle reissue (the 44.3-millimeter SRP7xx) didn’t inspire the Mini-Turtle in some way. Perhaps the success of the reissued Turtle indicated to Seiko that it was time to update the SKX007 with something a little more disco—or perhaps not. Alas, Seiko won’t tell us, but reconsidering the Mini-Turtle as the successor to the SKX007, rather than as the little brother to the Turtle, might help us get a grip on what is—at least for those of who who have cherished the SKX007—possibly a big moment in Seiko dive watch history. Starting with features that are not like the original Turtle, the Mini-Turtle has a date-only complication with an externally-mounted cyclops that looks more Rolex than Seiko at this point in dive-watch history. The cyclops magnifies the date to roughly the same size as the markers around the dial. The magnifying lens is relatively large, which aides off-axis viewing, but given the relatively small 30-millimeter crystal (and the even smaller dial) the cyclops is, perhaps, a little too big. However, when the minute hand slips beneath the cyclops, it looms large, offering up a fun-house effect for a couple of minutes every hour. Also unique are the Mini-Turtle’s tomb-stone markers, a cross-breed of the square markers found on the 6105 and the round ones found on the 6215, 6159, 6309, and SKX007 (see chart above). The Mini-Turtle’s V-shaped 12 o’clock marker is also a strange hybrid, and, again, not truly like any of its predecessors. Meanwhile the Mini-Turtle’s markers at 6 and 9 o’clock are directly lifted from the 6309 Turtle. All told, the Mini-Turtle’s marker set is, to my eye, a mawkish mash-up that lacks the cohesion and clarity of its brethren. With less space and larger markers, the Mini-Turtle’s dial is a bit crammed compared to its predecessors. Helping to cram the dial is the Mini-Turtle’s modern Prospex logo and two lines of white text beneath it, reading “AUTOMATIC” and “DIVER’S 200m.” Here the Mini-Turtle is identical to 2016’s reissued Turtle (SRP7xx), but there’s hardly enough space for all that white paint on the Mini-Turtle’s smaller dial. Further, the Mini-Turtle’s dial text is nothing like the original Turtle’s, which shares its layout and terracotta lettering with the SKX007—such that, once again, we see the SKX007 pulling as much from the original 6309 Turtle as the Mini-Turtle does. The Mini-Turtle sports a single row of notches on the upper bezel edge, this reminiscent of the 6217 (62MAS) (and decidedly unlike that on the Turtle, which, once again, lends this attribute to the SKX007). The Mini-Turtle’s bezel numerals are larger than on any of its predecessors, which goes some distance in setting the Mini-Turtle apart, but also competes for our attention with the dial. If there is a strong similarity between the Mini-Turtle’s bezel and those of the 6309 and SKX007, it is the lack of grip (something I learned to be less than ideal while SCUBA diving with 2016’s reissued Turtle and the SKX007). The Mini-Turtle’s upper coin edge is less Turtle and more 62MAS. Despite the flange, the Mini-Turtle’s case shares much of its form with the SKX007’s—specifically the size (a mere .2 millimeters difference) and the connections inside the lugs. Note that on the larger Turtle cases (especially the 2016 reissue), the flanged topsides wrap around the bezel, creating a right-angled slot for the strap to pass through, whereas on the Mini-Turtle and the SKX007 have lugs that are disconnected from the flange, exposing the connection between the mid-case and the bezel where the strap goes through. This detail is easy to miss on first glance, but it helps the Mini-Turtle resemble (and wear) like the SKX007. The SKX007 (left) and Mini-Turtle (right) share a similar inner lug geometry. The Mini-Turtle’s unguarded crown at 3 o’clock goes back to the 6217 (62MAS), and perhaps no other element sets the Mini-Turtle so far apart from its other predecessors, all with crowns at 4 o’clock. Viewed from the back, the crown tube of the Mini-Turtle extends out from the case like an axle, lacking entirely the tucked-in and well-guarded configuration of those divers with crowns at 4 o’clock. Though a solid whack might do some damage, I doubt that the Mini-Turtle’s unguarded crown is in any real jeopardy, though some may miss the visual integration of the 4 o’clock crowns. The Mini-Turtle’s lack of crown guards leaves the crown tube exposed. Most importantly, the SKX007 and the Mini-Turtle wear very similarly. The size is obviously near identical, but the way the strap wraps through the relatively low spring-bars, and thus the way the Mini-Turtle sits on wrist, are more reminiscent of the SKX007 than either the original 6309 Turtle or 2016’s reissue. The elegant connections between Mini-Turtle’s mid-case and bezel. Inside the Mini-Turtle is Seiko’s automatic-winding 4R35 caliber, with hacking, hand-winding, and 41 hours of power reserve. The SKX007, on the other hand, used the simple and reliable Cal. 7S26. The Mini-Turtle’s 4R35 engine is a typically reliable, no-nonsense Seiko unit, and given that none of these movements are visible, it will do its thing with quiet efficiency behind the solid case-back just as the movements inside all of its predecessors do. The Mini-Turtle’s case-back keeps the 4R35 movement safe. WILL THE MINI-TURTLE REIGN SUPREME? 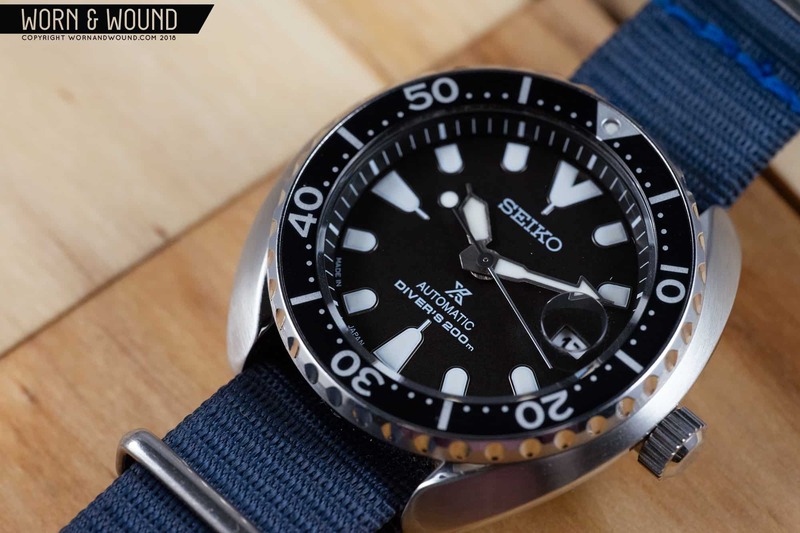 If indeed Seiko has updated the SKX007 with the Mini-Turtle, then Seiko may have also accomplished what most would agree is a warranted price increase. The Mini-Turtle sells new for around $340.00 US, a rather large price jump from the ~$200.00 SKX007, but that doesn’t mean the Mini-Turtle is unfairly priced as much as it indicates what a ridiculously good deal the SKX007 was for over two decades. The real downside of this progression from the SKX007 to the Mini-Turtle will land on those of us who prefer the SKX007’s style. The SKX007 (left) faces off with the Mini-Turtle (right). At the time of writing, the only mechanical divers in the Prospex range with a traditional 1960s case are the 62MAS spin-offs from 2017 (SPB051/3) and the 6159 spin-offs from 2018 (SPB077/8), which will cost you roughly double what you’d pay for a Mini-Turtle. Otherwise, one must reach above the Prospex line and spend around $5,000 for the limited edition 1960s reissues. None of these watches can touch the value that the SKX007 steadfastly offered for so long. I don’t mind a price increase, but I wish there were a high-performing, moderately sized, and affordable mechanical Seiko diver with a 1960s-style case—the kind of watch I can recommend to friends and family as breezily as I did the SKX007. Perhaps Seiko will eventually fulfill my wishes, perhaps with an SKX007 reissue or a MKII of some kind, but until then I will take comfort in the knowledge that my fellow watch-heads will continue to flip SKX007s over to those of us who can’t seem to get enough of them. *The nick-name Turtle remains somewhat enigmatic in origin and usage. While some may dispute whether the 6309 ought to be called the ‘Turtle’, I will adhere to common usage of the nickname to refer both to the 6309 and 2016’s reissue of it. ** At the time of writing, the Mini-Turtle has been a Japan-only release, and our listing the price at around $340 reflects street prices at this time. A US release of the Mini-Turtle through Macy’s is expected sometime this year.